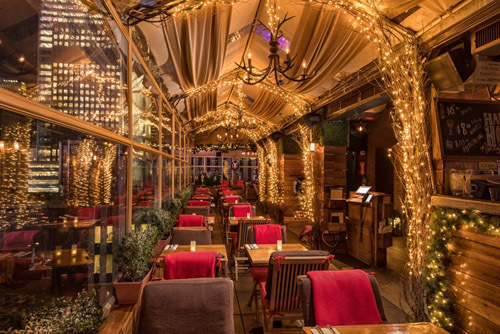 “Up on the rooftop, reindeer paws…” This month I give you the top 5 hottest NYC rooftop lounges to celebrate the holiday season. Depending on the weather, several have heating lamps and/or enclosures but all have signature cocktails, tasty food and incredible views of city landmarks. 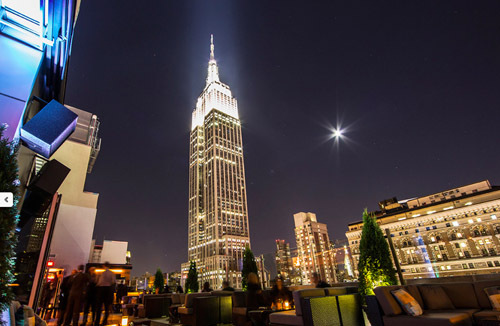 Directly across from Macy’s Department Store and Herald Square is Monarch Rooftop Bar & Lounge. The interior lounge is spacious and the vibe increases with merriment and a nightly DJ, plates to share and inspired cocktails. What I like most about this rooftop lounge is not only the towering Empire State Building hovering over the lounge like a bodyguard but also the intoxicatingly funny mixologist, Genese. Bring your group over and have her whip up one of her creations. I recommend the Absolut Smash made with cucumber vodka, Aperol, white cranberry, rosemary, lemon and a dash of orange bitters. 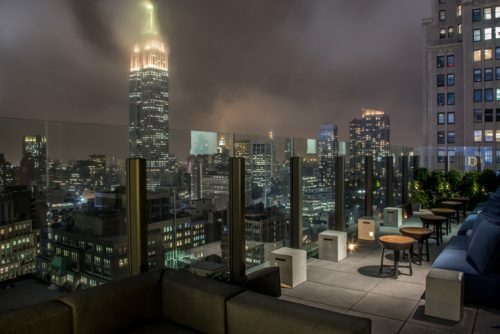 Atop The Sanctuary Hotel just a few steps away from Times Square is Haven Rooftop. This lounge offers a full menu of appetizers, dinners and plates to share as well as tasty desserts. Toast with one of their signature cocktails as you enjoy the spectacle of lights both in mid-town and the ‘Ski Chalet’ interior décor. This rooftop is enclosed but you will still be impressed with the views and ambiance. All desserts are made daily in-house and I recommend you try their Tiramisu made with layers of lady fingers, soaked in espresso, Kahlua filled with mascarpone mousse and shaved chocolate. The Skylark is my go-to lounge in the sky when I want to intrigue friends visiting the city. Set thirty stories above the heart of Times Square South, this location delivers a classically-styled cocktail lounge with expansive panoramic views of the Hudson River, Hudson Yards, Times Square, The Empire State Building, and the best of Midtown Manhattan. What’s most intriguing is how to get in. You will see a doorman standing by velvet ropes. He will ask if you have a reservation. Say no! Even if you do. You then walk into a cavernous and dimly lit labyrinth of a maze including a parking garage – security will guide you if you appear lost. A freight elevator will take you to the rooftop for a memorable experience. Note: The Skylark has several rooms and gathering areas with cityscape views from the interior. The exterior is only open if the weather permits. For those who are still shopping or planning on shopping for sales after Christmas, The Top of the Strand is conveniently located on 37th Street – just a quick cab ride from Bergdorf Goodman, Saks and walking distance from Lord & Taylor. Rest your tired feet with a glass of wine and take in the scene before you head back out into the battle zone. The retractable roof will either keep you toasty warm or let the sunshine in depending on the weathercast. 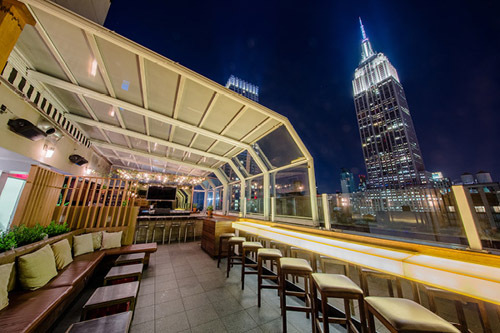 Gloved hands down and mitten thumbs up, 230 Fifth Rooftop Bar takes the number one slot for winter rooftop lounges. This impressive hot spot is open year round, 7-days a week come rain, shine, sleet or snow. They serve a food menu but consider it a bar with bites. They get high marks for the several igloos set up that seat 12 guests. It’s a first come, first serve basis (no reservations). Visitors are encouraged to share the igloos with strangers and make new friends. For the winter, they offer virgin and alcoholic hot beverages like hot chocolate and coffee drinks. Complimentary red robes are offered for those can’t handle the burrrrrrr of this season. 230 Fifth also has a popular weekend buffet brunch. NOTE: Acknowledge the dress codes before you venture out. It’s best to contact each location prior to your visit as many lounges hold private parties during the holiday season. Let is snow. Let it snow. Let it snow! Happy holidays and read City Pulse every month for insider tips on what’s happening in and around New York City.